This summer, we continue our plan to document, stabilize, and preserve the Samuel P. Ely in Two Harbors. Using the 30-foot steel dive boat recently donated to GLSPS by Jay Chester, we replaced three more 3/4” support rods with 1” three piece steel rods. Now all five original 3/4” rods have been replaced with 1” rods. We then installed a sixth 1” rod about 3 feet forward of the other rods. The rod’s end nuts were tightened to secure the ship’s sides together. 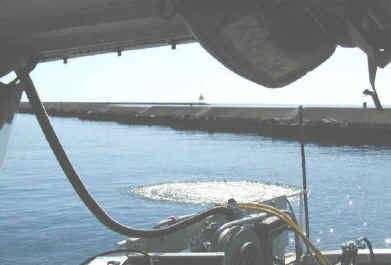 Three of the original two piece 3/4” rods had broken so it was necessary to replace them with more and stronger rods to avoid loosing ground on the vessel’s stabilization. Many loose deck planks were also re-secured using 5 inch galvanized lag bolts and washers counter sunk beneath the plank’s surface. The steel rods, plates, and fasteners were again donated buy LeJeune Steel Company located on West 60th Street in Minneapolis. 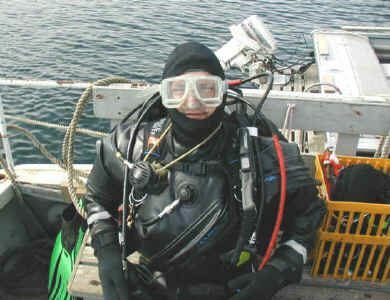 Our dive boat made two trips from Silver Bay Marina to Two Harbors and divers Bob Olson, Bob Nelson, John Ortiz and Todd Olson from Northland Diving, Phil Kerber, Rick and Lynette Hiles, Paul Bullock and Ron Johnson did the work. The new dive boat worked great for hauling the steel and performing as a stable work platform for diving and repairing the Ely. 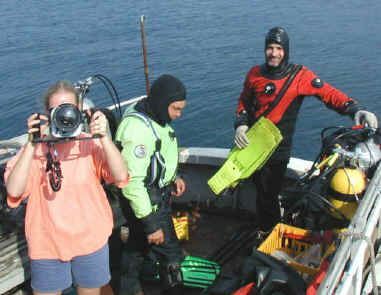 More surveying and documenting was accomplished with the aid of video documentation by Rick and Lynette Hiles. Many thanks to the all the people and business who have supported this project. This was a busy summer and we didn’t get as much done as hoped, but we will continue with our goal to preserve the integrity of this very special vessel. We will be developing the Ely preservation plans for next summer and will publish them in our spring newsletter and on our web page. All GLSPS members are invited to help out with these projects. Please contact Bob Nelson at 651-426-1159 or through our web site if you would like to help or contribute. 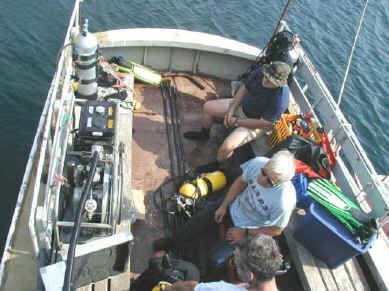 Bob Olson pumps tanks on our newly acquired Wreck Diver boat. GLSPS never travels light. Wreck Diver back deck. 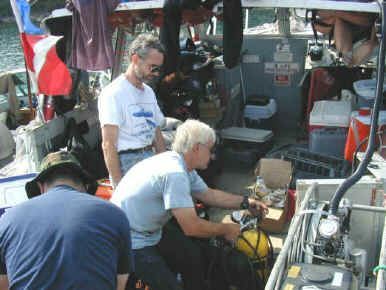 Bob Olson helping divers suit up for the Ely rod repair work. 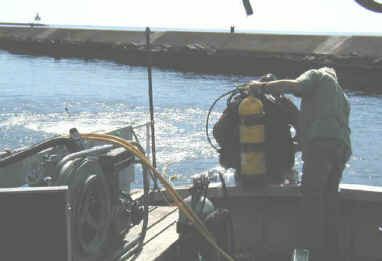 Pneumatic tools and divers keep the water well aerated above the workplace. Rick and Lynette Hiles document the work on video. Ron Johnson is usually behind the surface camera, but managed to get a mug shot before joining in the work.